I started training at a gym when I was in my last year of high school. My boyfriend introduced me to this form of exercise and since then I’ve trained as often as possible. Dave and I belong to a privately owned gym and training is as much about fitness as it is about being with like minded people. One of the youngsters who trains there works at a body studio. He invited Dave and I for a demo session and so off we went. I decided to watch what it was about while Dave did the hard work. He had to put on a lycra outfit and then a jacket was put on over that, with bands across his chest, thighs and biceps. He was hooked into an electrical impulse machine and did a few exercises. A session lasts 20 minutes and is supposed to be equivalent of 5 hours in the gym. This in no way excites me. The hard work and sense of accomplishment are taken away from you, and it’s expensive. As for hard work, Yorkshire puddings are anything but. They are simple to make and when you take the puffed up pastries out of the oven you too will feel a sense of accomplishment. I love Yorkshire pudding and might have to do more than 20 minutes at the gym with electrodes on to burn off those calories but so worth it! Totally worth the extra training! I have never have eaten Yorkshire pudding. I have to put on my list to try, they sound yummy. Gym strapped in lycra and machine or eating Yorkshire puddings? Hmmm let me think about that… for 1 second. I love Yorkshire pudding and had the best ever when I lived in London and was invited to Rule’s! I could not have afforded it myself as I lived on a pittance! These would definitely make me feel more accomplished than doing most things at the gym lol! But, you do Zumba and that looks really hard! 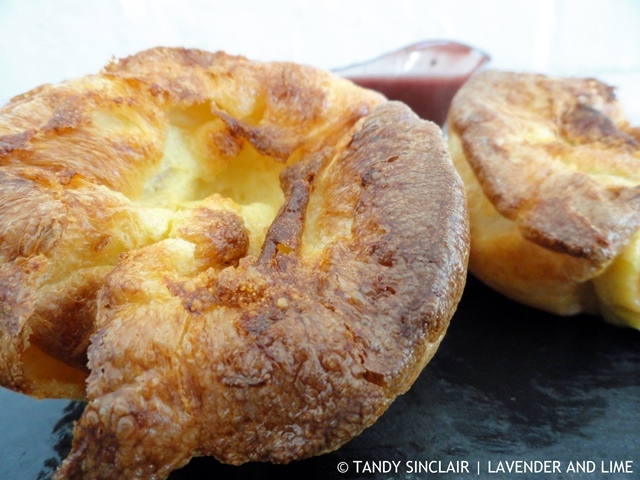 I have never made Yorkshire pudding…and yes, they sure look look and love the the idea that it is simple…thanks for the recipe Tandy! Your Yorkies look great, Tandy! Perfect for the cooler weather! I hope to eat some in Yorkshire this year! Mmmm it’s been a long while since I had Yorkshire pudding – I wish I could climb through my screen and sneak one of yours! I am intrigued but this whole lycra suit/jacket/bands experience Dave went thru – was it some sort of “sweat it off” type thing? That’s how I feel often Shashi. The clothing was to assist with the conductivity of the electricity! I’ve never had Yorkshire Puddings before. They look fun to make and so tasty! I’m really surprised that you say Yorkshire Puddings are easy to make. You have tickled my curiosity and now I’m eager to try my hand at them. They are so tasty! And the gym, I wish I was better at working on in front of other people. Just this last weekend I had an “order” put in for Yorkshire Puds. Haven’t made them for a while. I wish I could put the order in, instead of making them! What temp do you bake the puddings at? Also do you have to rest the mixture? I’m not one for exercise of any kind, but I’ll never say no to a plate of roast beef with Yorkies, yum! Sounds a terrifying way to do exercise, couldnt think of anything worse than being hooked up to a machine and having to pay a fortune to do it. Oh, always a favourite – Tandy – and yours look wonderful.